With seven world-class golf courses located within the Banderas Bay areas of Punta de Mita, Nuevo Vallarta, and Puerto Vallarta, this region has risen in the ranks to challenge Cabo San Lucas as the leading golf destination in Mexico, and is now considered to be the 14th most popular international golf destination. Great architects such as Jack Nicklaus, Tom Weiskopf and Robert von Hagge have all designed courses here. Golfing on championship courses with stunning views of the tropical Sierra Madre mountains and the Pacific Ocean is what draws top golfers back to Banderas Bay year after year. This exclusive golf course located in Marina Vallarta was the second golf course built in Puerto Vallarta. Some consider this course to be one of the toughest in the area. It offers an 18-hole, par-71, 6,700-yard championship course designed by the famous American architect Joe Finger. Many of the holes are long, and 10 have water. Additional features include crocodiles, iguanas, turtles, and birds. There is a charge for storing clubs. Drinks are expensive. Spread across 48 acres, it encompasses two 18-hole, par-72 championship golf courses: a Signature Golf Course Design by golf legend Jack Nicklaus, and a Signature Course Design by golf superstar Tom Weiskopf. The Club’s amenities include practice facilities, a luxurious clubhouse, restaurant, bar and lounge, verandas, a golf shop, and on-course beverage service. Four Seasons – Pacifico Golf Course: This 200-acre, par-72, Jack-Nicklaus-designed course uses an island off Puerto Vallarta, 194 yards from the coast, as one of the greens. Eight of its holes have a view of the ocean. Four Seasons – Bahia Golf Course: Like the Pacifico, this gorgeous course follows the contours of the coastline, offers additional challenges, lagoons and slopes. Both courses are obviously intended for use by Four Seasons Resort guests. Non-guests can play if the are willing to pay the hotel 50% of the room rate plus 28% tax and service fee. Conde Nast Traveler’s Annual Readers Choice Awards 2012 named The Four Seasons Punta Mita as the #1 Golf Resort in the world. Located in beautiful Nuevo Vallarta, just 8 miles from the airport, this is the area’s first golf course, and was designed by Percy Clifford in 1978. Covering more than 72 acres, this gorgeous 18-hole, par-72 championship course is renowned for its delightfully well-groomed courseway that has a noticeably natural feel to it, and Bermuda grass that is soft, not coarse. It has 9 water hazards and 43 bunkers. During your game, you may have the opportunity to view crocodiles, anteaters, turtles, and birds. Services include putting green, driving range, pro shop, golf lessons, rental clubs, golf carts, caddies, golf club storage, dressing room with showers and lockers, car bar, and open-air palapa restaurant and bar. Flamingos Golf offers complimentary transportation from the main hotels in PV. Of all the area’s courses, Flamingos has the most reasonable fees, with golf carts included in their rates. Located in Nuevo Vallarta, and part of the Mayan Palace Resort, the back 9 holes of this 18-hole course were redesigned by the Jack Nicklaus Design firm in mid-2010. This course is well maintained and in excellent condition. Guests are challenged by seven lakes, a river and the sea, and sometimes by the direction of the changing wind. 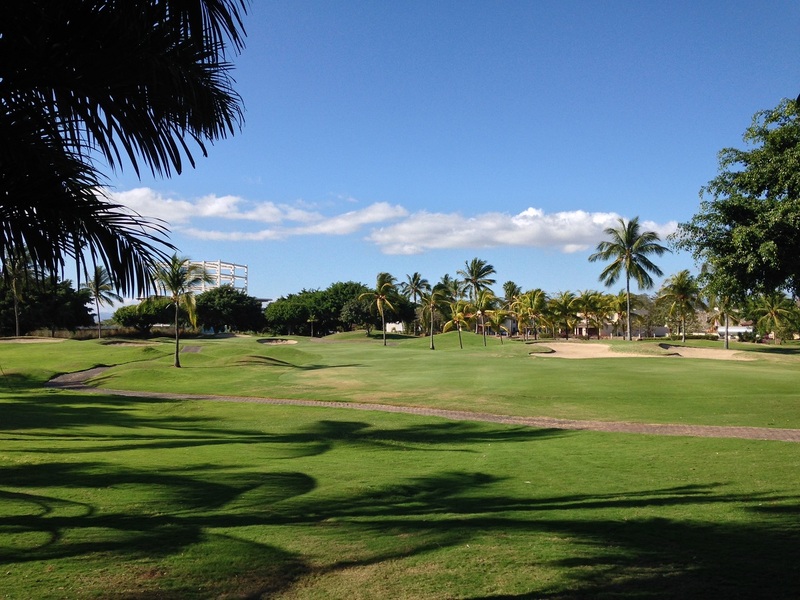 From the 18th hole, golfers are treated to an incredible panoramic view of Banderas Bay. Amenities include a golf shop and restaurant, and complimentary storage of clubs. On-course drinks are good, and prices are fair. Great service overall. Golfers enjoy breathtaking views of the Pacific Ocean. Fees are mid-range and include golf carts. Return transportation to hotel is provided. Golf Guide Magazine & Golf in Mexico Magazine reviews for 2008 list this course as the Top 10 Best Golf Course in the country. Located at the Paradise Village hotel and condo complex in Nuevo Vallarta, this 18-hole course designed by Robert von Hagge has 12 water features. El Tigre hosts several national and international tournaments. Many top golfers have proclaimed this course to be one of the most challenging in Mexico. It has traps in 13 of the 18 holes, including a par-3 hole played entirely on an island. The greens fees run approximately $150 USD plus tax, and include a shared golf cart, bottled water, cold towels, and practice balls. Upon arrival golfers will pass through an impressive stone archway resembling a Mayan temple, and view a Bengal tiger living in a secure habitat. Many golfers claim that this masterpiece, created by architects Robert Trent Jones Jr. and David Flemming, is the most beautiful golf course in the world. Many golf publications have rated it as The Best Hidden Link in the World. A two-hour drive south of Puerto Vallarta, and located in a vast ecological preserve, this majestic 6,615-yard, par-72 course features stunning fairways that wander through the jungle. It boasts three breathtaking oceanfront holes, and nine holes with incredible views of gorgeous beaches on rocky untouched coastline.